A man was refused service at a California coffee shop after he made racist comments toward another customer wearing a headscarf. The unidentified man was recorded mocking the woman's niqab and telling her he "didn't want to be killed by you" while in line at a Coffee Bean & Tea Leaf, before another customer stood up for the woman and staffers told the man to leave. At the start of the video the man addresses the woman in the headscarf, saying "Is this Halloween or something?" "Why did you say that?" the woman asks. "Why wouldn't I?" he replies. Identifying herself as a Muslim, the woman then asks the man what his problem is. "I don't like it, that's why," he says to the woman. "I don't like your religion, it says to kill me — and I don't want to be killed. How's that?" The two then begin arguing over religion and an employee tries to separate them. Another customer in the background can then be heard yelling at the man, "Get out of here! F---ing racist!" The man asks for a manager and takes down the name of a supervisor before leaving. When asked why the customer was not being served, the employee says, "Because he is disrupting a public place and being very racist." Journalist C.J. 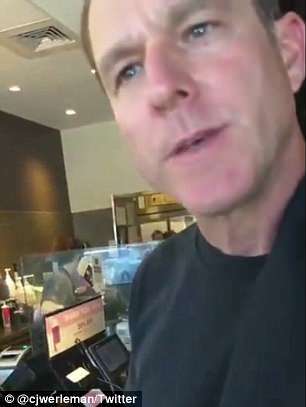 Werleman posted the video of the encounter to his Twitter account, reporting the incident happened Friday at a California branch of the coffee chain. Social media users praised the supervisor and the customer who intervened. "Thank you to the @TheCoffeeBean and that supervisor for standing against racism and hatred!" wrote one person. "Big round of applause to the victim, to the person defending her from the background and to @TheCoffeeBean. Hatred must not be the norm, it must not be the way, we cannot let it win. #Peace #NoMoreHate #StopTheHate #HateSpeechIsNotFreeSpeech," wrote another. Another compared the store's reaction to another recent incident involving racism at a Philadelphia Starbucks, in which two black men were arrested while waiting for a business meeting. "Thank you to the stranger who yelled at the racist pig and to the supervisor at Coffee Bean who did the right thing," a Twitter user wrote. "Hey, Starbucks — you could learn from this."